“The Northern border of the United States, the Northern Border of the United States….”the words being sung by my 6 yr old trailed downstairs from the shower upstairs. Yes, he is a chid who loves singing in the shower. Honestly, he loves singing in the bathroom. There’s something about the way the words vibrate off the walls and he has a sense that no one hears him. Me, I’m sitting at the table giggling with my daughter. And it hits me – he can name of every state in the United States. Well, he can sing them. He doesn’t know them. I’ve resisted teaching by song only. I think it adds value, but can’t be the only thing. Adding it to the daily schedule in the car or around the house, it adds another layer to the love of learning I desire to instill in my children. So, we have added it but not just as singing. We have added singing with a book of maps and our globe to help gain an overall sense of the names and actual locations. Because really – where is the northern border of the US – what does it look like and how could I possibly know what I’m looking at – if I am only seeing it. 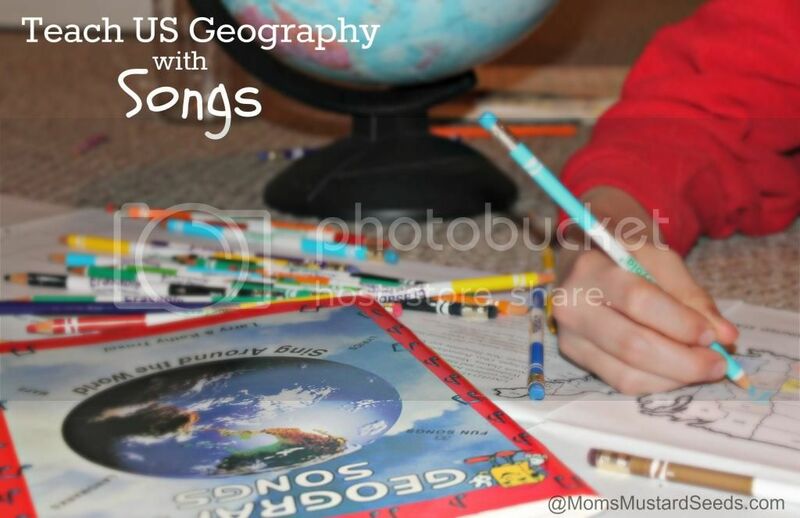 So, here is another great way to teach your children US Geography – with songs, a book and a globe. This brings in the sense of hearing, feeling, and sight! Our First pick is Geography Songs . We have really enjoyed singing the songs and coloring the map. There are other books, audios, etc you can use. I’ve pulled together a list for you (it is on the carousel below). If you are a subscriber – you can view the list here. And don’t forget, it’s fun to learn Geography with Board Games! Thanks for the recommendation, my daughter will learn anything with song. Hi Rebecca! Thanks for sharing this post at NextGen Homeschool’s “What’s Working Wednesday” link-up today. I recently confirmed that my youngest is an auditory learner and have been looking for more good quality learning song CDs for her. This one sounds great!